McLane arrives at the Christmas party that Holly’s company is throwing in their skyscraper, but the reunion is bittersweet as their previous bickerings resurface. They are soon interrupted, however, by a gang of international terrorists led by the evil Hans Gruber (Alan Rickman in a career-defining role). The terrorists soon commandeer the entire building, cutting off phone lines and rounding up all the hostages. McLane, however, manages to escape their notice and run into the unfinished levels of the building as the terrorists prepare to execute their master plan. He soon proves to be a thorn in their side, taunting them with a CB radio while simultaneously communicating with an LAPD officer (Reginald Veljohnson) on the outside. As McLane continues to disrupt the terrorists’ plans, a situation develops on the outside that requires the attention of the LAPD and the FBI; each subsequent person-in-charge is stupider than the previous, as it is clear that Gruber is in control and McLane is the hostages’ only hope. As the film moves to its explosive climax McLane proves to be unkillable, if not invulnerable. The film’s most immediate impression comes in the form of nicely executed action sequences. Few American films have provided such a well-rounded mix of coherent fist fights and smooth gunfights. The camera remains stable and steady, allowing the audience to fully absorb the situation and providing a showcase for Willis to prove that he is a bona fide action star. Even better, McLane is allowed the time to fully develop as a character. His internal struggle to win back Holly, while acknowledging his previous jerkiness, is convincing, making the audience feel more closely connected to both McLane and his wife. In addition to providing smart, rounded characters, Die Hard excels technically. The production is practically spotless, from outstanding sets and effects to subdued costumes that only slightly date the film. John McTiernan’s directing is natural and inspired: watch how frequently McLane is framed to the far left or right of the screen, often only partially in view even when the rest of the frame is blank. His isolation is not only described by the action, but also by the filmmaking. Strong and fluid editing (by John F. Link, who worked on Predator, and Frank J. Urioste, who cut both RoboCop and Total Recall) ensures that the film never slows down while remaining cohesive and comprehensible. 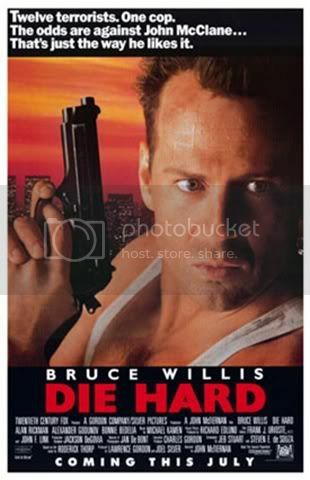 Some people will enjoy Die Hard for its exciting action and an enjoyable plot featuring a complex heist. Others will appreciate the technical expertise employed by the cast and the screenwriters (Jeb Stuart and Steven E. de Souza, from Roderick Thorp’s novel), and the tongue-in-cheek Christmas-themed musical score by Michael Kamen. All of these elements together create a fantastic genre film, and one of the greatest American action films ever made.